Now that VMware’s vSphere 6.7 is here, admins far and wide are starting to plan out their upgrade journeys. But the added capabilities of 6.7 mean that this upgrade process is slightly different from ones in the past. 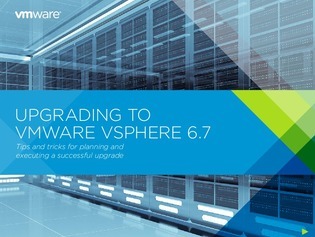 In this 40-page eBook, find out everything you’ll need to know when considering an upgrade to vSphere 6.7, including the three phases that comprise the upgrade process: pre-upgrade activities, mapping the upgrade, and upgrade completion.